1981 – The first vinyl video record, a.k.a. the videodisc, hit stores in the U.S. The “Capacitance Electronic Disc” looked just like any other vinyl record protected in a plastic caddy and held 60 minutes of NTSC video. That is approximately 27,000 frames per second. However, the CED players did not make the impact RCA had hoped. Only 100,000 were sold by the end of the year. The “BetaMax vs. VHS” war was in full swing and the tapes were considerably smaller than the discs. 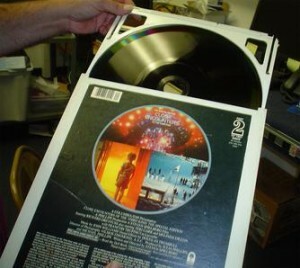 Laserdisc was also available to the public, which led to a lot of confusion of formats.